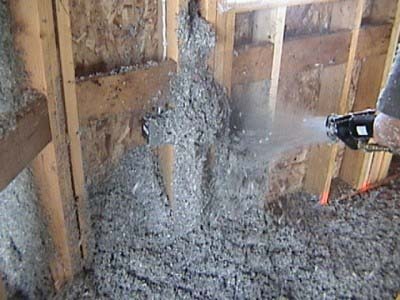 If you need cellulose insulation contractors serving the Twin Cities area in Minnesota, look no further than Metro Home Insulation & Waterproofing. We work with homeowners and builders/contractors to install cellulose insulation in homes and commercial buildings for new construction projects. For your insulation to work properly, it must fill in completely around the odd shaped crevices and obstacles in a new home’s walls, ceilings and floors. Usually, these areas are created by plumbing, air ducts and wiring, so it’s imperative to have them properly insulated. Cellulose insulation is sprayed or blown into your home’s walls, so its ability to provide a seamless insulation system is perfect for these instances. Stop searching for “cellulose insulation companies near me,” and get in touch with us if you’re ready to begin your insulation project, or keep reading to learn more about cellulose! Cellulose insulation is made from recycled newsprint and other recycled paper. Consisting of up to 80 percent recycled content and requiring less energy to make than other types of insulation, it’s one of the most environmentally friendly insulation materials available. Walls – Keep your home comfortable and the noise between rooms minimal with wall insulation. When it comes to improving energy efficiency and comfort, you can rely on the team at Metro Home Insulation! Being a part of the Installed Building Products family of companies, we offer knowledge, experience and resources that few local companies can match. To learn more about our services or to get a free cellulose insulation estimate, call us at 763-400-8616 or contact our insulation experts online!